This talk was delivered virtually today at Western Oregon University. The slide deck is available here. “Education is the civil rights issue of our time,” you’ll often hear politicians and education reform types say. Education is still the key to eliminating gender inequities, to reducing poverty, to creating a sustainable planet, and to fostering peace. And in a knowledge economy, education is the new currency by which nations maintain economic competitiveness and global prosperity. 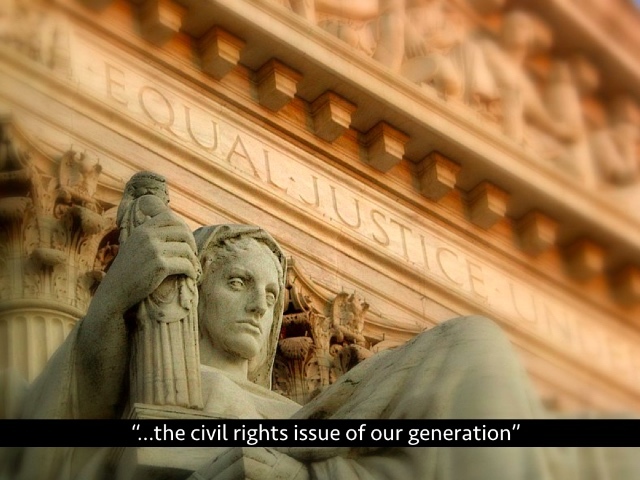 …Closing the achievement gap and closing the opportunity gap is the civil rights issue of our generation. 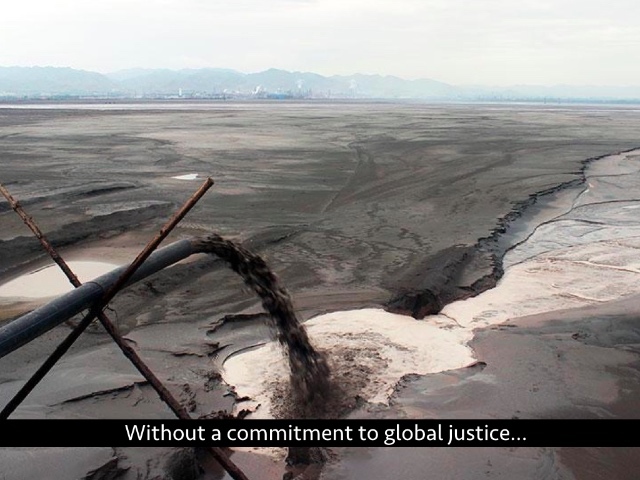 According to Agarwal and others, MOOCs – and more broadly, education technology, online education, the World Wide Web, and the Internet – serve to magically erase systemic inequalities. This is what technology critic Evgeny Morozov has described as “techno-solutionism,” the simplification of complex societal problems into apps and algorithms. That is to say, we have exchanged political activism, collectivity, debate, democracy, social change for (education) technology consumption and usage. The world is broken – schools are broken – the techno-solutionists say, but the ubiquity of mobile computing devices will somehow save us. No doubt, the existence of the “digital divide” has long served to undermine the sweeping proclamations about technology as the great equalizer. And despite assumptions and claims that this divide has been mostly bridged as personal computer ownership has increased, access to new technologies still looks quite different for different demographics. According to 2013 figures from the Pew Research Center, for example, “the demographic factors most correlated with home broadband adoption continue to be educational attainment, age, and household income.” 74% of white adults have broadband Internet at home; 64% of African American and 53% of Latino adults do. 89% of those with a college degree have broadband at home; 57% of high school graduates and 37% of those without a high school diploma do. 88% of those who earn more than $75,000 have broadband at home; just 54% of those who earn less than $30,000 a year do. What are the implications for equity here if, for example, we uncritically pursue trends like the “flipped classroom” – that is, asking students to watch video lectures at home? What assumptions are we making about “home”? Can MOOCs really solve the opportunity gap if those without a college or high school degree are far less likely to have adequate let alone affordable Internet access? And what about the digital divide at school? 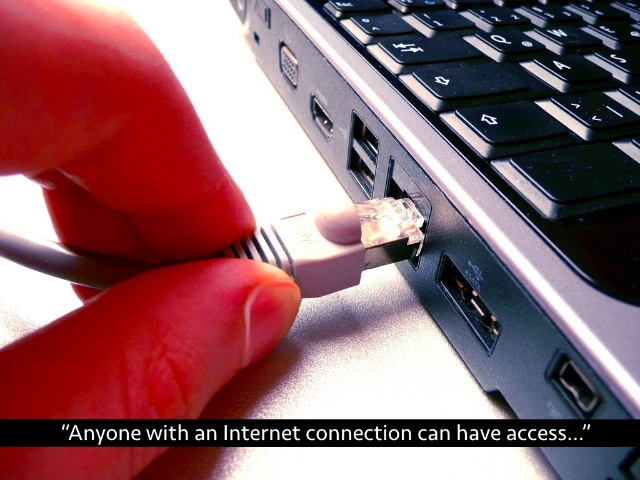 Although almost all public schools and libraries in the US are connected to the Internet, 80% of K–12 schools report that their Internet access is insufficient to meet their current needs. (By and large, those current needs do not including supporting one device per student or the use of bandwidth-heavy applications like video.) 40% of K–12 schools in the US do not have WiFi. 36% of schools with WiFi say that they do not have enough bandwidth to support one-to-one initiatives. 41% of rural schools lack access to fiber networks; 31% of urban schools do. Not surprisingly, low income schools lag much farther behind when it comes to broadband access. According to EducationSuperHighway, an organization pushing for better connectivity at schools, just 14% of low income schools – that is, schools where 75–100% of students qualify for free or reduced lunch – have Internet access that meets their current needs. Overall, HarvardX registrants tend to reside in more affluent neighborhoods. U.S. HarvardX registrants on average live in neighborhoods with median incomes approximately .45 standard deviations higher than the U.S. population. Parental education is also associated with a higher likelihood of MOOC enrollment. For instance, a seventeen year-old whose most educated parent has a bachelor’s degree is more than five times as likely to register as a seventeen year-old whose most educated parent has a high school diploma. The rhetoric of “open” and education technology – particularly with regards to MOOCs and OER – needs to be interrogated. “Open access” is not sufficient. Indeed, as research by Justin Reich suggests – he’s also one of the authors of the MOOC study I just cited, incidentally – open educational resources might actually expand educational inequalities. 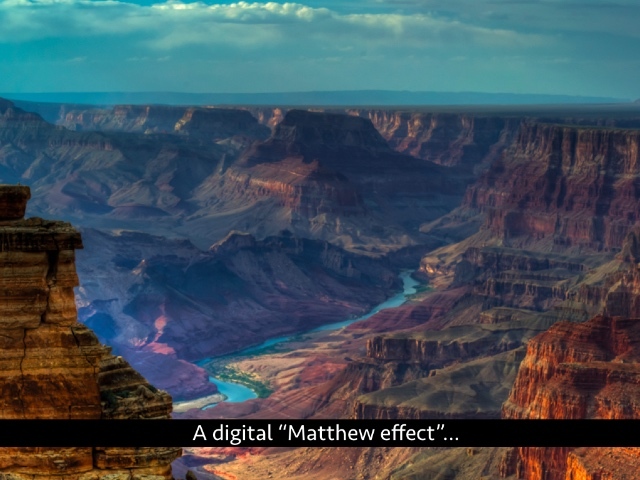 A digital Matthew effect, if you will, where new technologies actually extend the advantages of the already advantaged. Reich’s assertion that education technology broadens rather than erases educational inequality is echoed elsewhere. An article published last year in the journal Economic Inquiry, for example, found that “the introduction of home computer technology is associated with modest, but statistically significant and persistent negative impacts on student math and reading test scores.” Importantly, the negative impact was the greatest among low income students, in part the authors suggested because “student computer use is more effectively monitored and channeled toward productive ends in more affluent homes.” That is, students from affluent homes have a different sort of digital literacy and different expectations – themselves and from their parents – about what a computer is for. But we must ask, some 35 years after the publication of Mindstorms and with a renewed effort recently for one-to-one computing at school, which children get this opportunity? Which get to use computers for self-directed learning? Which children experience this epistemological turn? 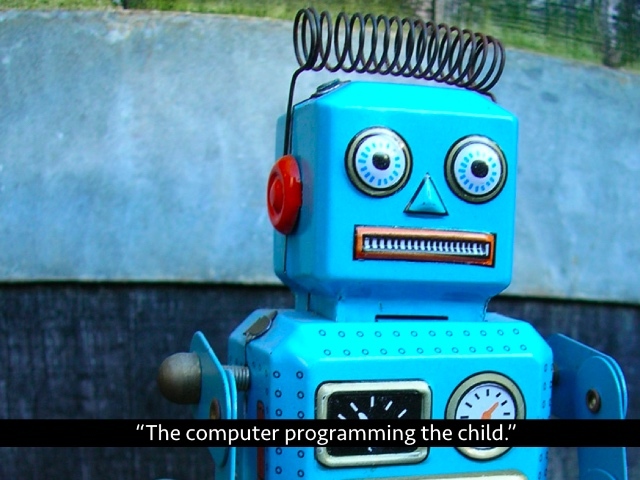 And which children, which students still experience education technology only on the days they’re taking assessments – with the computers “putting them through their paces”? 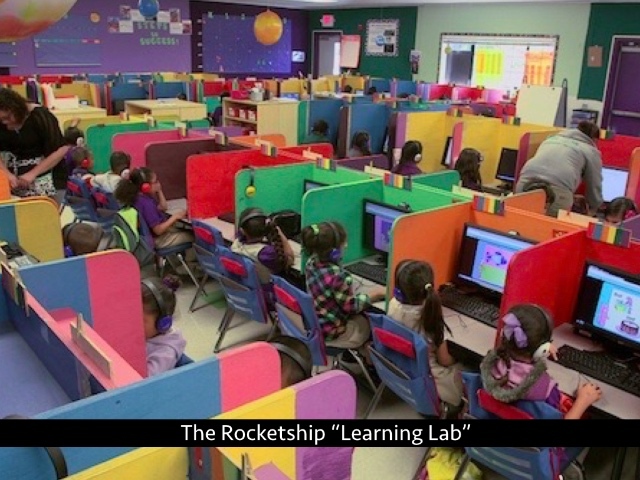 It’s a still from a 2012 PBS NewsHour episode on Rocketship Education, a chain of charter schools founded in San Jose, California in 2006 by John Danner, a Silicon Valley software engineer. With a nod to Henry Ford and the development of the production line, the episode asks, “Can Rocketship Launch a Fleet of Successful, Mass-Produced Schools?” In this formulation, students are objects of an education system – mass-produced. They are not subjects of their own learning. These schools, which serve primarily low-income Latino and African-American students, are perhaps best known for their “learning labs,” where 100 or more elementary-age students fill one room, sitting in cubicles, working independently on computers, using software like DreamBox Learning. (Netflix CEO Reed Hastings is an investor in both DreamBox and Rocketship.) 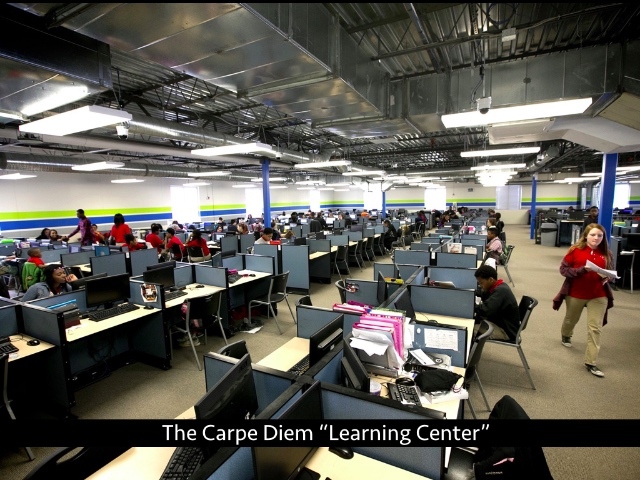 There are no teachers in the learning labs; there are teachers’ aides – an arrangement that Rocketship boasts saves it hundreds of thousands of dollars per school per year. The schools focus solely on literacy and math – that’s what the standardized tests focus on, after all. Rocketship could, for a time, boast quite good standardized test scores, particularly for a school serving a low socioeconomic student population. But as the chain has expanded, those scores have plummeted. According to Education Week, “the number of Rocketship students scoring ’proficient’ or above in English/language arts has plunged 30 percentage points over the past five years, to 51 percent, while math proficiency rates have dropped more than 14 points, to 77 percent.” And while students might perform adequately on standardized tests, they have also learned, as one Rocketship administrator put it, to be “good rule-followers.” Once they move on to middle school, the students struggle with independence, with collaboration, with problem-solving. They have learned to be compliant, not creative. In the … working-class schools, work is following the steps of a procedure. The procedure is usually mechanical, involving rote behavior and very little decision making or choice. The teachers rarely explain why the work is being assigned, how it might connect to other assignments, or what the idea is that lies behind the procedure or gives it coherence and perhaps meaning or significance. …Most of the rules regarding work are designations of what the children are to do; the rules are steps to follow. These steps are told to the children by the teachers and often written on the board. The children are usually told to copy the steps as notes. These notes are to be studied. Work is often evaluated not according to whether it is right or wrong, but according to whether the children followed the right steps. Anyon’s work is critical as it highlights how students’ relationship to “the system of ownership of symbolic and physical capital, to authority and control, and to their own productive activity” are developed differently in working class, middle class, and elite schools. Her work helps us to see too how the traditional practices of school might be reinforced, re-inscribed by technology – not, as some like to argue, magically disrupted, with these hierarchies magically flattened. Menial tasks are still menial if done on a computer. 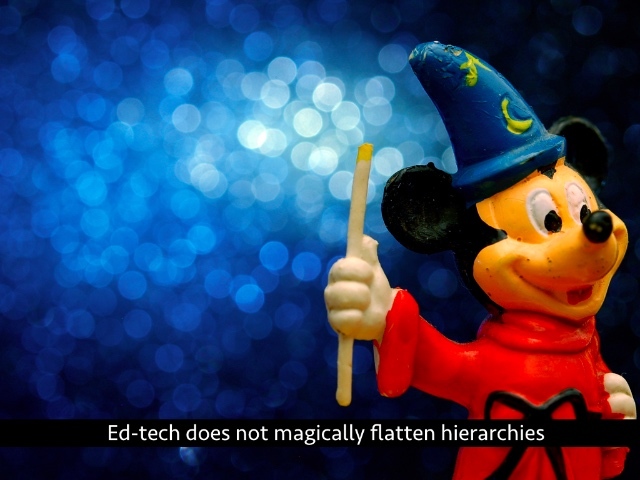 To argue otherwise is ed-tech solutionism – dangerous and wrong. If we’re only concerned about the digital divide, we are likely to overlook these questions. We cannot simply ask “Who has access to Internet-connected devices at home?” We need to ask how Internet-connected devices are used – at home and at school? When we develop and use educational technologies that monitor a student’s every moment in school and online, we groom that student for a lifetime of surveillance from the NSA, from data brokers, from advertisers, marketers, and even CCTV cameras. By watching every move that students make while learning, we model to students that we do not trust them – that ultimately, their every move will be under scrutiny from others. When students recognize that they are being watched, they begin to act differently – and from that very moment they begin to cede one small bit of freedom at a time. This surveillance is increasingly pervasive, at both the K–12 and at the college level. New education technologies create more data; new education technology regimes – education policy regimes – demand more data. The surveillance of students, and the surveillance of school employees as well. 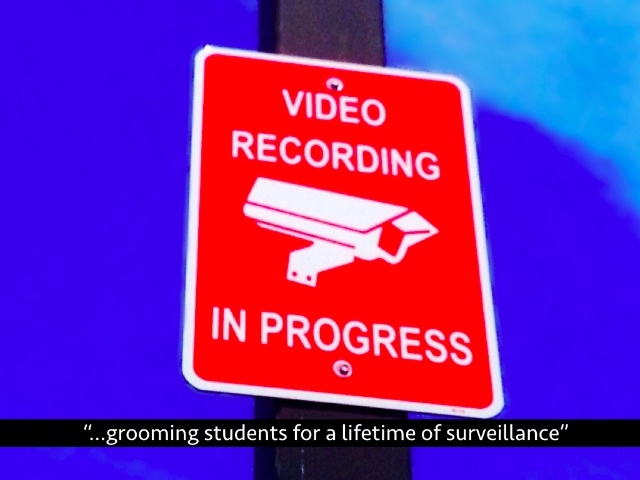 Sometimes it’s framed as safety and “protection”; sometimes it’s tied to a new regime of “performance metics.” And, yes, surveillance is part of an old regime too that is deeply intertwined with school as a disciplinary institution – the school-to-prison pipeline. Take the Huntsville City Schools in Alabama, for example, which “expelled 14 students last year based on the findings of a private contractor who monitored students’ social-media activity as part of greater school security efforts.” 12 of them were Black. 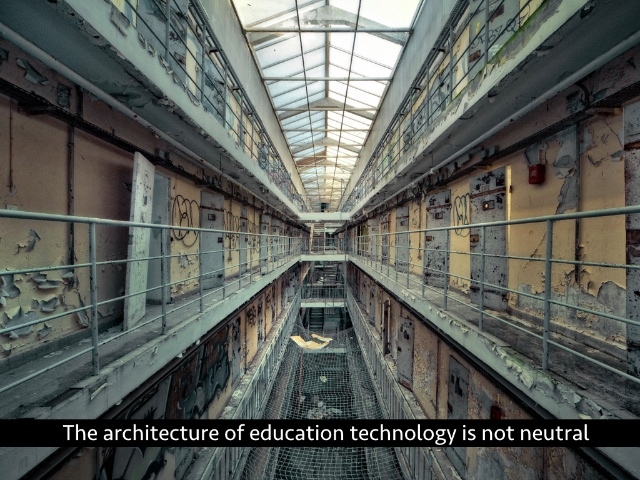 The architecture of education technology is not neutral. Despite all the hype and hope about revolution and access and opportunity that these new technologies are supposed to provide us, they do not negate hierarchy, history, privilege, power. They reflect those. They channel it. They concentrate it, in new ways and in old. I’ve spoken frequently in the past about gender and education technology. I often point to culture of Silicon Valley – the subtle and not-so-subtle misogyny – as well as the demographics of the technology sector. 70% of Google employees are male, for example. 61% are white and 30% Asian. Of Google’s “technical” employees. 83% are male. 60% of those are white and 34% are Asian. And I’ve argued that this culture, these bodies shape what gets built; they shape, even how the “problem” of education gets framed and gets “fixed.” I should add something here, however, particularly in light of an article in the business of technology publication Fast Company last week suggesting that ed-tech is “where women are starting to buck the tech world’s sexist trends.” The ideologies of education technology – its connection to hierarchy, surveillance, stratification, discipline, power – are not undone just by having more women in education entrepreneurialism. Privileges, ideologies, expectations, values are hard-coded into our education technologies, in ways that we rarely explore – in part because of the narratives that education and ed-tech are wonderfully meritocratic, woefully ahistorical, and yet somehow inherently equalizing. One of the new features that many discussion forums boast: the ability to vote up or vote down certain topics. Ostensibly this means that “the best” ideas surface to the top – the best ideas, the best questions, the best answers. Why, it’s meritocratic, some will argue. But what it means in practice often is something else entirely. In part this is because the voting power on these sites is concentrated in the hands of the few, the most active, the most “engaged.” And no surprise, “the few” here is often overwhelmingly male. Reddit, which calls itself “the front page of the Internet” and is the model for this sort of voting process, is roughly 84% male. I’m not sure that many MOOCs, which have adopted Reddit’s model of voting on comments, can boast a much better ratio of male-to-female participation. Sites like Reddit will remain structurally incapable of producing non-hegemonic content because the “crowd” is still subject to structural oppression. You might choose to stay within the safe confines of your familiar subreddit, but the site as a whole will never feel like yours. The site promotes mundanity and repetition over experimentation and diversity by presenting the user with a too-accurate picture of what appeals to the entrenched user base. 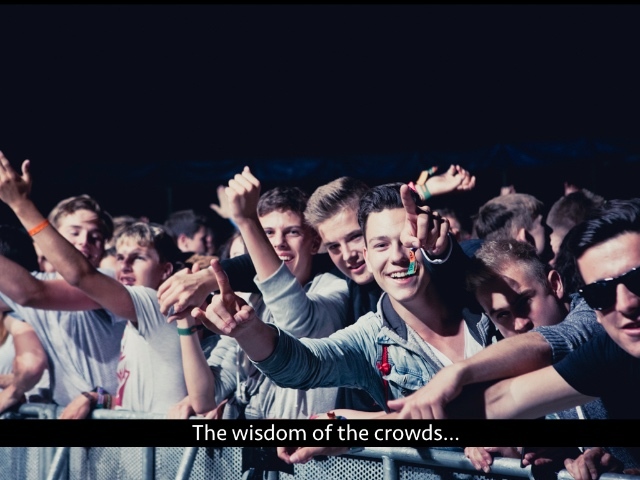 As long as the “wisdom of the crowds” is treated as colorblind and gender neutral, the white guy is always going to be the loudest. This passage wipes away structural inequality and imperialism and replaced it with gratitude. This is the great challenge for those of us in education: to address and not dismiss the toxicity. Adding technology does not scrub it away. To the contrary, we need to recognize where and how and why education technology actually makes things worse.